#Office365Challenge This is my first post about Microsoft Sway. I’ll only be covering the basics, so join me on my journey of getting to know and use Sway. Go from start to finish in minutes – Sway makes it quick and easy to create and share polished, interactive reports, presentations, personal stories, and more. Add your content, and we’ll do the rest. Tell your story with interactive content – Bring your Sway to life with interactive content. Include a video to talk about your idea or add an interactive chart to let others dive into the details. See suggested search results based on your content – Sway suggests searches to help you find relevant images, videos, tweets, and other content that you can drag and drop right into your creation. No need to juggle apps and web pages to find what you want. Easily share by sending a link – It’s super easy to share a Sway. Family, friends, classmates, and co-workers can see your creation on the web without signing up or downloading additional software. And you can change privacy settings for more control. Instantly transform your Sway with great designs – You don’t need to worry about formatting, Sway’s built-in design engine takes care of it. If the first design isn’t right for you, Remix! it to see others or customize it to make it your own. Sway is used to create presentations, newsletters, product brochures etc. Sway for Office 365 allows for sharing within your organization and if enabled in the Admin centre – for external sharing. 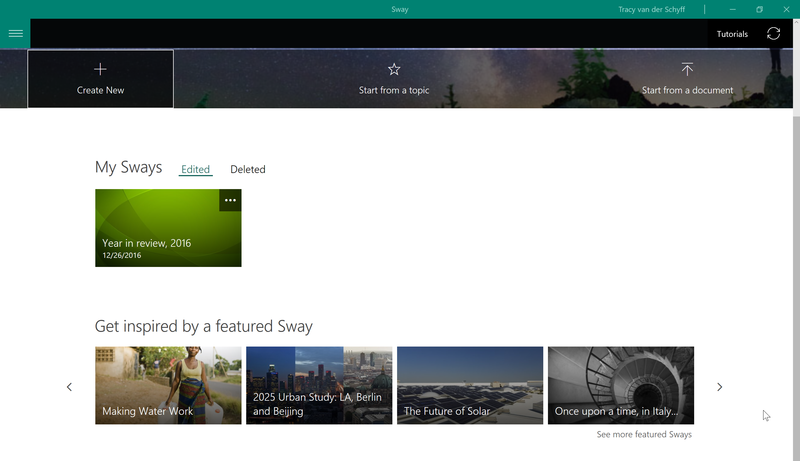 Sway is free for non-commercial use if you have a free Microsoft Account. These Office 365 plans include Sway at no additional cost. In this blog I’ll cover the menus etc. to help us be more comfortable using it. Insert – here you can ‘fetch’ content from other sources and search for related images on the web. Once you’ve entered your title it will start presenting you with images to use. 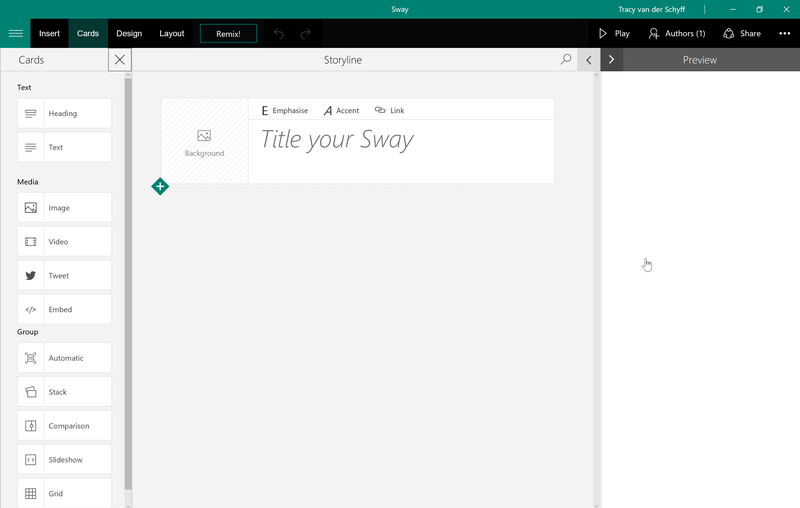 Layout – here you can choose whether your sway swipes from left to right or from top to bottom. Remix – allows you to very quickly let Sway to re-style your presentation. Share – is where you’ll define the sharing options. See you tomorrow when we’ll start building our Sway. Take the time to go gather some images and make notes of text you’d like to use.